Chocolate treats that are good for you? Count me in! 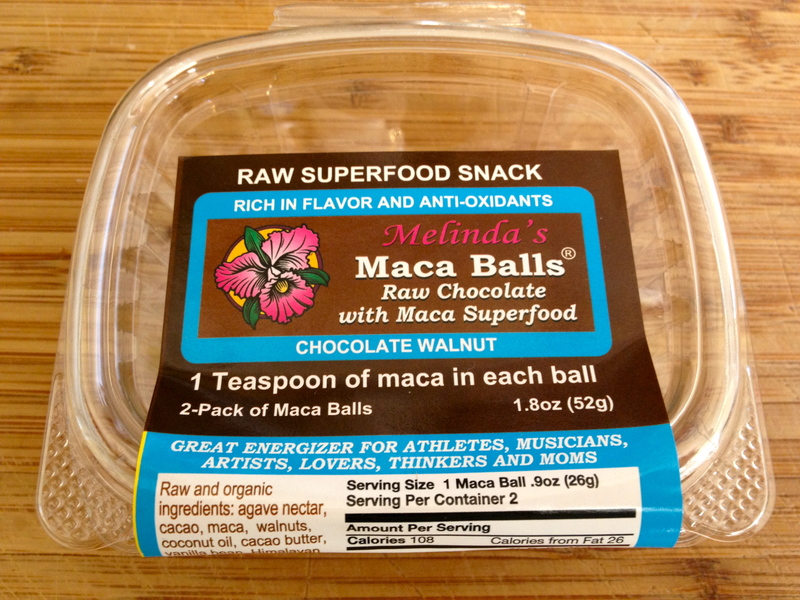 Melinda’s Maca Balls are an organic, vegan, raw, snack bursting with rich, chocolate flavor. And there is one teaspoon of maca in each ball! Maca has been around for a long time. Legend has it that Incan warriors used to ingest large amounts of maca for strength before heading into battle. Mr. Wolf notes that maca supports healthy hormones, is rich in fatty acids, and contains important trace minerals and amino acids. Maca is also important, because it helps the body adapt to stress. Melinda’s Maca Balls are made from whole, organic ingredients and come in 3 flavors: (1) Chocolate Walnut, (2) Double Chocolate Chip, and (3) Chocolate Mint Chip. Agave nectar, cacao, maca, coconut oil, cacao butter, vanilla bean, and Himalayan pink salt make up the base of each ball. 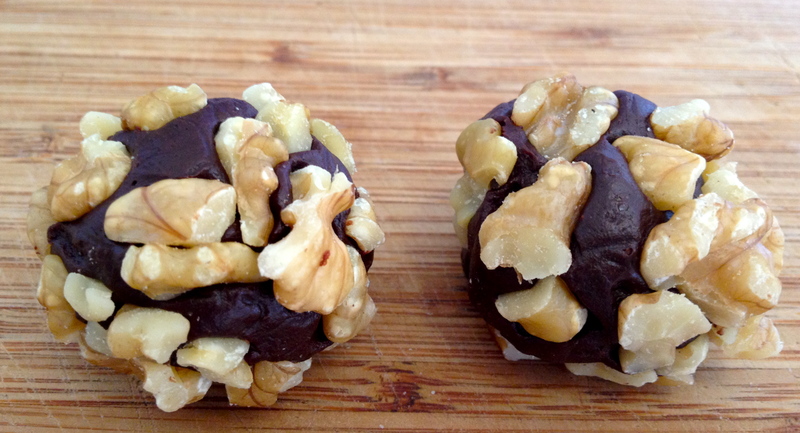 The Chocolate Walnut Maca Ball with its dense, chocolate center is coated with walnut pieces. It is my favorite — in my opinion, chocolate and walnuts can and should be mixed together as often as possible! 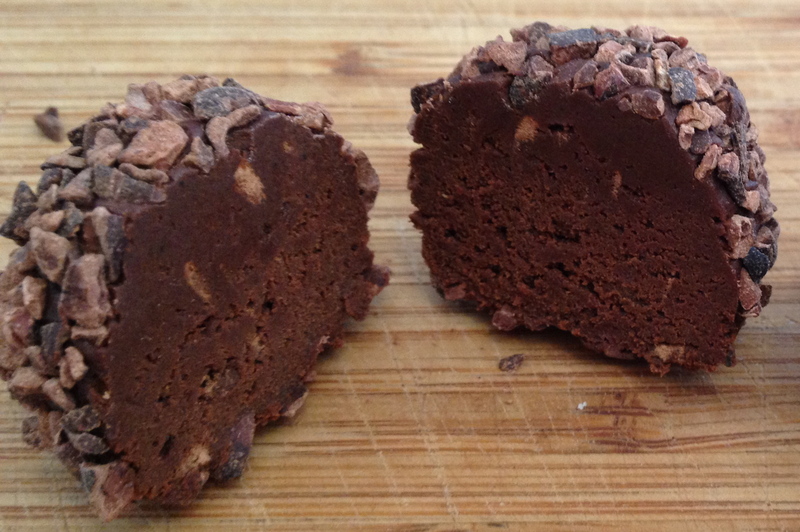 The Double Chocolate Chip Maca Ball has the same dense, chocolate center but is covered with cacao pieces. It’s chocolate on chocolate – perfect for those who are looking for their next sumptuous treat! So far, I have not been able to find the Chocolate Mint Chip Maca Balls in a store. However, if the other flavors are a barometer for the Chocolate Mint Chip flavor, I am in for a treat! Melinda’s Maca Balls are a decadent maca delivery device. I recommend enjoying them sooner rather than later!